I adapted this recipe from the Brown Eyed Baker. 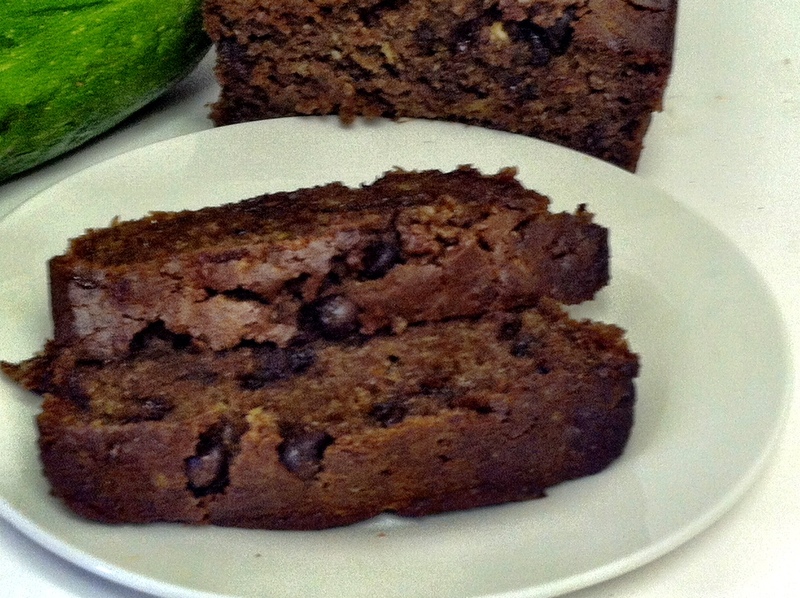 It is so moist and delicious no one would ever suspect it is gluten free and full of healthy zucchini. 1. Preheat oven to 350 degrees F. Grease and flour an 8×4-inch loaf pan; set aside. 2. In a medium bowl, whisk together the flour, salt, baking powder and baking soda; set aside. 3. In a large bowl, whisk together the eggs, vegetable oil, cocoa powder, brown sugar, sugar, vanilla extract and applesauce. 4. Add the flour mixture to the wet ingredients and use a rubber spatula to gently fold the batter together until almost no flour remains. 5. Fold in the zucchini and chocolate chips. 6. Pour the batter into the prepared loaf pan and bake for 55 to 65 minutes, or until a toothpick (or thin knife) inserted into the center comes out with just a few moist crumbs attached. 7. Allow to cool in the pan for 15 minutes, then turn out onto a cooling rack to cool completely before slicing. Store leftovers at room temperature, tightly wrapped in plastic wrap.